Electives can be incredible. I love teaching them, but I've also found they are not without their challenges. I often find my electives to be a mix of two types of students, the students who love English so much they are taking two English classes (an advanced course and an elective) and students who have struggled so much in English that electives are their best option to be successful. Teaching a course that truly interests you and that you can fill with content so inviting and empowering that both types of students can succeed will help so much. There's more to the story than that, of course, teaching strategies matter too. 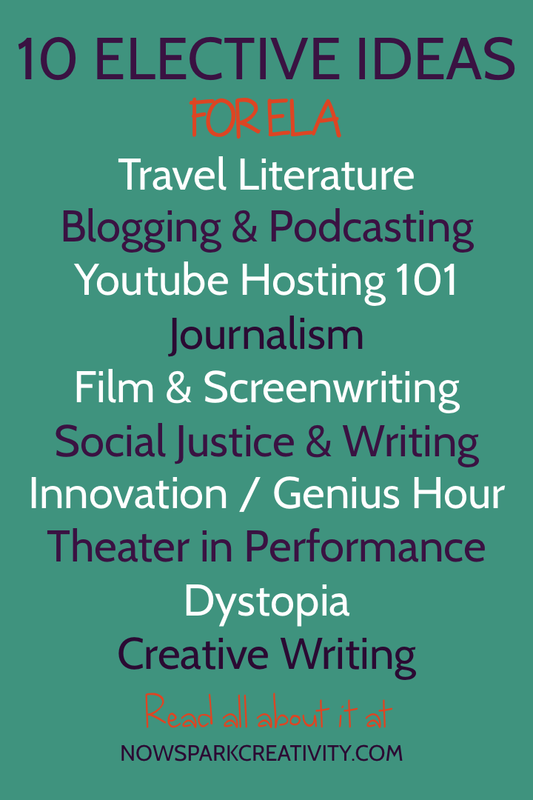 But this post is to help you find a course elective concept you love! 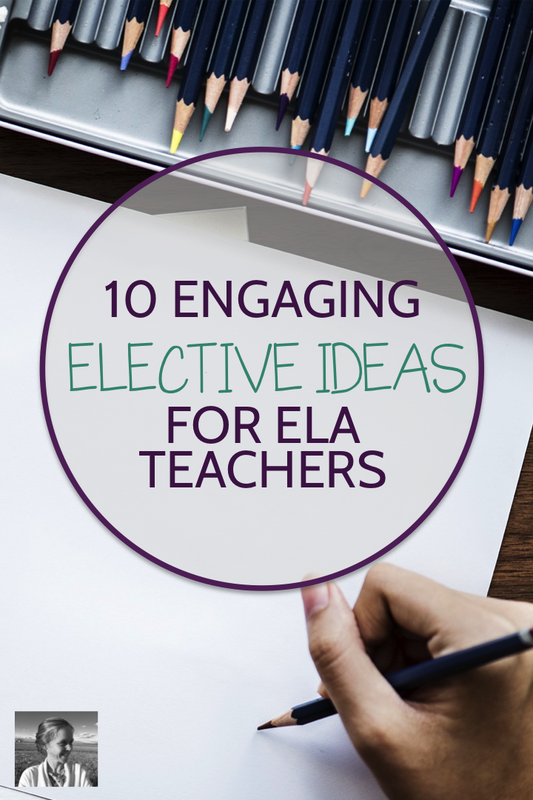 So without further ado, here are ten elective ideas for your next ELA course design project. Do you love visiting other countries through books like The Sun Also Rises, Eat, Pray, Love, and A Year in Provence? Travel literature is popular and broadening, and for students longing to stretch their horizons, it will make an appealing elective. The topic also lends itself well to an exploration of modern travel media, since travel vlogs, podcasts, Instagram feeds, and blogs are so popular and prevalent. Bring your students into the world of modern journalism and let them explore their own passions when you introduce them to these two mediums. Help them set up their own channels and then share stellar models from around the web before launching them to write, curate, and record their own work. They'll love the authentic audience, and you'll love the engagement. A lot of kids out there dream of becoming a Youtube sensation. The great thing about Youtube is that there is a market for practically every topic. As with blogging and podcasting, students can share on whatever topic truly interests them. They will still need the essential ELA skills of research, writing, and speaking to be successful. Get them going in iMovie and share tutorials of your own or online every week to help them learn new techniques in their video creation. While subscriber numbers won't have anything to do with their final grade, you can bet they will love realizing they are impacting viewers around the world as those numbers grow. Journalism sure has changed in the last two decades. In a modern journalism class, you can explore everything from writing to video creation to podcasting to social media. Have students write about what's happening in their own community, and submit pieces to writing contests and local newspapers. Or start a class news site online or a class social media channel. Are you a movie buff? In the era of Netflix, students have more access than ever to films and T.V. shows whenever they want them. Tap into their interest by studying great films with them and then launching into screenwriting units of your own. Let them create T.V. show and film scripts, act out scenes, even dabble in storyboarding and filming. All these skills are highly relevant in a world where a writer might well be asked to script and shoot a short video clip in relation to whatever they are writing about. Aaah, the classic. 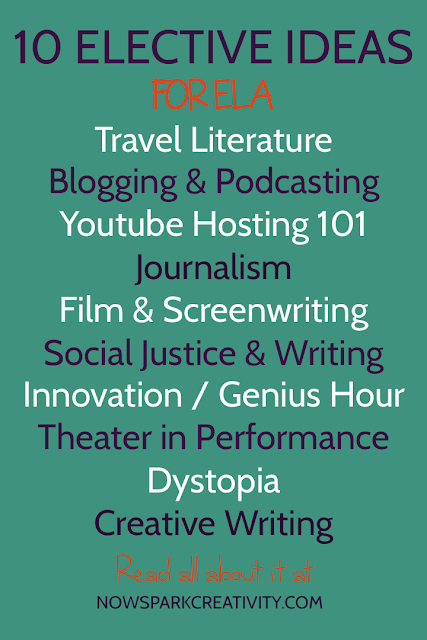 If you'd like to keep your focus wide, propose a creative writing class and cobble together bits of all these elective options. Have students enter writing contests, try out Nanowrimo (National Novel Writing Month), record a podcast, script a youtube video, write a short story, start a blog, and more. Creative Writing is a header under which almost anything is possible. For this elective, give students a peek into the impact powerful writing can have. Study great speeches, poetry, essays, and films that have impacted the human condition. Use design thinking to help students launch a project of their own to impact the community where you live. For this elective, students will get to study whatever they want. "Whaaaaat?" you say? Yes, if you decide to try out this elective, you will be trekking into an amazing new wilderness with your students, encouraging them to pursue their own passions through reading and research and then create products reflecting their work. A student might choose to delve into the local food movement and then help start a farmer's market in your neighborhood, putting her ELA skills to good use as she writes letters to local farmers, records a video for a new market website she designs, and goes on a local radio show as a guest. You get the idea! This class requires a lot of one-on-one, so you want to get the basic structure and timeline clearly in place so students know it's not pure free for all. Do your student love drama? Give kids a chance to get up on stage when you create an elective centering around studying, writing, and performing plays. Start your own one-act festival and involve other local schools. Invite an actor as a guest speaker. Watch screencasts of theater from around the world. Put on a class play at a local elementary school. Whatever else you do, bring in costumes. There's a reason dystopia is sweeping the world. Ask your teenagers to help you figure out what that reason is as you study the literature they are choosing in their free time. What is so powerful about dystopia? Why does it resonate with this generation? Where do we go from here? Travel through the worlds of The Hunger Games, The Uglies, The Maze Runner, Divergent, and so many more as you and your students go deep with dystopia. OK, and I'm adding an eleventh idea. This one is a bit rogue, but ever since I heard about a friend teaching it a decade ago I have been in love with the idea. Seriously. That was the class. Isn't that a great idea? You could interpret this so many ways. Maybe you teach students how to waltz, change a car tire, make bread, write a thank you card, sew on a button, and repaint a wall. Or maybe you spin it another way and teach them how to podcast, edit video, take great photos, write a killer hook, and design a website. Hopefully one of these ideas will feel like a great springboard to you as you get going in the exciting project of course design. By the way, did you know there is a big new free resource section on my website? I think you're going to love it! Just jump over here to explore all the available free downloads, like one-pager templates, syllabus templates, attendance questions, book posters, and more.